Size of this preview: 553 × 599 pixels. 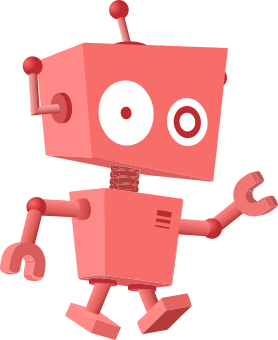 Other resolutions: 221 × 240 pixels | 5,000 × 5,420 pixels. Description: A stunning example of Mitchell’s seminal 1846 pocket map of Texas, Oregon, Upper California, Missouri Territory, the Indian Territory (Oklahoma, though in this example including most of Kansas and Colorado). This important map of Texas is one of the first widely-circulated maps of the early statehood period. This map shows the borders of Texas extending to Santa Fe. Also includes Texas’ claim to the Upper Rio Grande in present day New Mexico. These claims were eventually given up in the 1850 “Great Compromise”, wherein the U.S. Federal Government assumed Texas’ public debt. To make this map Mitchell compiled the mappings of Arrowsmith (1841), Fremont, Emory, Wilkes, and Nicollet, as well as making use of data from the Louis & Clark expedition. 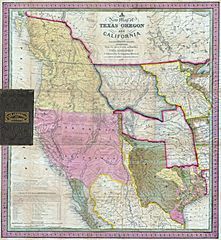 This map was very popular when issued due to general interest in the new state of Texas as well as the Mexican-American war, which started the same year the map was issued. Brigham Young, the Mormon Moses, famously ordered six copies of this map when planning the 1847 Mormon migration west. One of the most important maps in American history. Accompanied by a 46 page text entitled Accompaniment to Mitchell’s New Map of Texas, Oregon and California, includes among the best contemporary descriptions of Oregon and California . Removed from but accompanied by the original 16mo gilt-lettered roan folder. 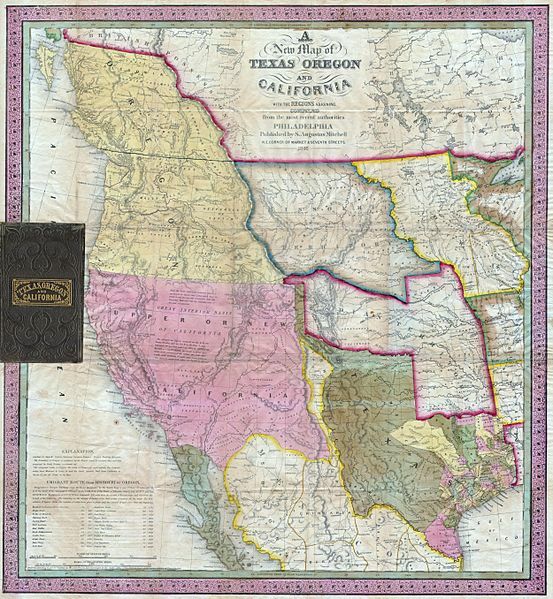 Title: A New Map of Texas, Oregon and California with the Regions Adjoining.